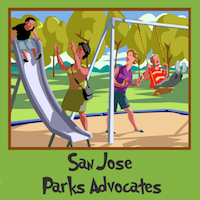 San Jose has a new proposal to divert $11M in Park Trust Fund fees to operations and maintenances of the three big downtown parks from long-planned land acquisitions, major improvements and necessary infrastructure renovations and repairs. With no public outreach, the proposal is scheduled for a December 2 hearing. This diversion is on top of $20M in prior discounts, depriving the downtown area residents of more than $30 M in park improvements and major repairs. There’s currently over $40M in backlog. Downtown area residents are expected to do without.